After the war, the Society re-formed and resumed its activities. For the first time for many years, however, the choice of show was limited. Scenery and costumes, stored during the war, had been lost through bombing or became unusable. There were, in addition, important financial considerations. Finally, 'The Rebel Maid' was selected and, with the rise of the curtain in February, 1946, the Thespians were back in business. WendyWright's tribute to Mr Sharman, mentioned earlier contains one slight inaccuracy, as revealed by the words of Mr R. H. O. Wright to the audience after the Saturday evening performance of 'The Rebel Maid'. Apologising for the absence of the new President, Mr H. W. Russell, he referred to the loss, since the last production, of two outstanding personalities. 'Last June, Mr P. A. Sharman, founder of the Society forty years ago, relinquished office as our President ... and it is right ... that we should pay tribute to the fact that it is due to his leadership that the Society is in its present happy position.' The second stalwart now retired from active service was Miss Kathleen "Cissie" Wurr, daughter of the Thespians' former conductor. 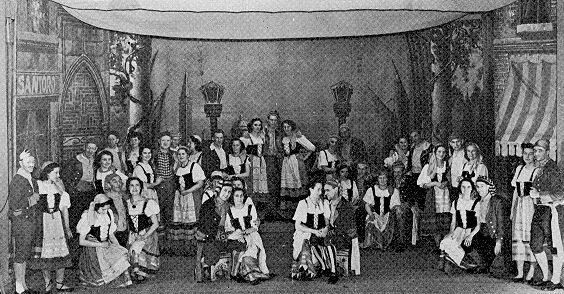 She had been the honorary accompanist from the early days, almost without a break until 1939, and this was the first occasion on which she had seen the show from the other side of the house. Harry Rusself, Mr Sharman's successor, joined the Thespians in 1910 and played many principal parts in the Gilbert & Sullivan operas. From 1930 he was active off stage as Business, Advertisement and Stage Manager in turn. 'Thank you, Thespians,' wrote one grateful critic, for giving us, in a time of austerity, a feast of colour and music.' The real world, indeed, was bedevilled with the restrictions of the immediate post-war years and in 1948, petrol rationing and other such evils persuaded the Thespians to return to a more modest production in the Town Hall. 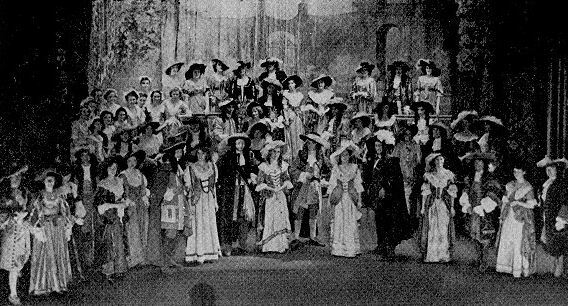 There 'The Gondoliers' was presented for the fourth time, reviving many pleasant memories, both for members of the Society and for their public. The next year, however, saw the Thespians back at the Hermitage Cinema with a production of 'Chu Chin Chow'. The Press and the audiences were quite enchanted by the piece. Eight thousand people saw it and Peter Penn, writing in the 'Hertfordshire Pictorial', said 'I have seen every Thespians' show since the 1912 (sic) production of 'Patience', but I don't think that any one of them has moved me so much as this week's magnificent 'Chu Chin Chow'. He noted 'that glorious jewel ballet in the Cave Scene - the only setting, by the way, that I ever remember a Hitchin audience applauding for the scene alone. Not a movement on that glorious colour-soaked setting of sequins and silk as the curtains rose, but there was spontaneous applause from the first-night audience.' After the Saturday evening performance, the new President, Mr W. G. Willmott, an active member in a variety of ways since 1919, presented N.O.D.A. medals for twenty-five years' service to Connie Powell, the Stage-Manager and H. O. Willmott, the Stage Carpenter. 'Chu Chin Chow' was followed, in 1950, by a repeat of 'Rose Marie'. There was a dramatic climax to the first night performance. Jean Rice, playing Wanda, was taken ill and was unable to take her final bow. 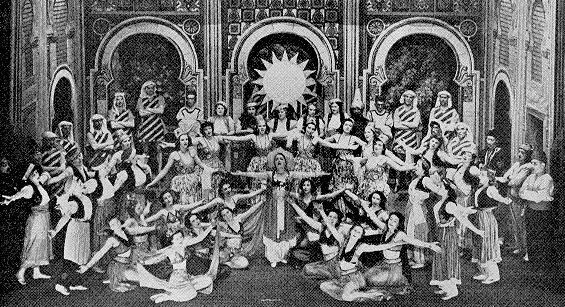 Her place was filled on succeeding nights by Peggy Tomkys, who had had the role of Wanda in the 1933 production. Nor was this the only difficulty experienced and overcome in this show. As The 'Hertfordshire Pictorial' noted, 'Maurice Saunders took the part of Emile at only three weeks' notice, owing to the original choice being taken ill, and made an excellent job of it.' The indefatigable Connie Powell joined the 'Totem Dancers' at very short notice when one of their number slipped on the stairs and badly sprained an ankle at the Sunday rehearsal.